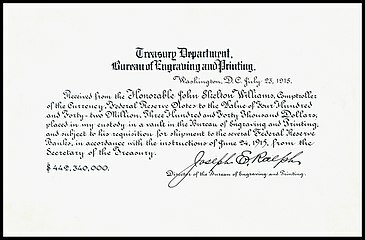 A Bureau of Engraving and Printing receipt for $442,340,000 in Federal Reserve Notes from Comptroller John Skelton Williams, dated 23 July 1915 and signed by Joseph E. Ralph, Director of the BEP. A receipt (also known as a packing list, packing slip,, packaging slip, (delivery) docket, shipping list, delivery list, bill of parcel, manifest or customer receipt), is a document acknowledging that a person has received money or property in payment following a sale or other transfer of goods or provision of a service. All receipts must have the date of purchase on them. If the recipient of the payment is legally required to collect sales tax or VAT from the customer, the amount would be added to the receipt and the collection would be deemed to have been on behalf of the relevant tax authority. In many countries, a retailer is required to include the sales tax or VAT in the displayed price of goods sold, from which the tax amount would be calculated at point of sale and remitted to the tax authorities in due course. Similarly, amounts may be deducted from amounts payable, as in the case of wage withholding taxes. On the other hand, tips or other gratuities given by a customer, for example in a restaurant, would not form part of the payment amount or appear on the receipt. In some countries, it is obligatory for a business to provide a receipt to a customer confirming the details of a transaction. In most cases, the recipient of money provides the receipt, but in some cases the receipt is generated by the payer, as in the case of goods being returned for a refund. A receipt is not the same as an invoice. There is usually no set form for a receipt, such as a requirement that it be machine generated. Many point-of-sale terminals or cash registers can automatically produce receipts. Receipts may also be generated by accounting systems, be manually produced or generated electronically, for example if there is not a face-to-face transaction. To reduce the cost of postage and processing, many businesses do not mail receipts to customers, unless specifically requested or required by law, with some transmitting them electronically. Others, to reduce time and paper, may endorse an invoice, account or statement as "paid". The practice in most shops at the point of sale is for a salesperson to scan or in some way record the price of a customer's proposed purchases, including tax, discounts, credits and other adjustments. In traditional situations and still in some family businesses today, the salesperson would then show the customer the summary, the invoice, for their agreement; but many shops today bypass this stage. The practice of presenting an invoice is most common in restaurants where a "bill" is presented after a meal. The salesperson would indicate to the customer (whether by way of an invoice or otherwise) the total amount payable, and the customer would indicate the proposed method of payment of the amount. Payment in cash or by payment is regarded as payment of the amount tendered, but payment by store account is not. After processing the payment, the salesperson would then generate in the one document an invoice and receipt. If payment was made by a payment card, a payment record would normally also be generated. The invoice and receipt are the printed record of the transaction, and are legal documents. A copy of these documents would normally be handed to the customer, though this step may be dispensed with. In many countries, a retailer may be under a legal obligation to provide a receipt to a customer which shows the details of a transaction and the shop and other information, so that the tax authority can check that sales and related taxes are not being hidden. The document may also include messages from the retailer, warranty or return details, special offers, advertisements or coupons, but these are merely promotional and not part of the formal receipt. Receipts may also be provided for non-retail operations such as banking transactions. Shops that use barcode readers may generate receipts with a barcode of the receipt identification number, that enables a salesperson to scan the barcode and quickly retrieve the details of the original transaction, for example:if a customer seeks to return or exchange goods or there is some other query. If linked to a customer shop account, some retailers' point-of-sale systems also allow the salesperson to see a complete record of the customer's buying history. A receipt (or a copy of a receipt) is the proof of purchase usually needed in order to make a return and often plays a vital part in a company's return and exchange policy. An invoice goes to the person responsible for paying the bill while the shipping list (or packaging slip) goes to the recipient. The shipping list is included in the shipped box. In some scenarios, the same person will pay the bill and receive the shipment. However, a person can buy and pay for a product and send it to someone else (i.e. a gift). Shipping lists vary depending on the business and its products. Every shipment to a customer should contain a shipping list that includes the order date, the products included within the box, and the quantity of each product. Some businesses may want to include the weight of the product next to the item. Many receivers use the shipping list as a guide or checklist when unpacking their order. If something is missing from the box, they cross-check it with the shipping list and then alert the seller. Hand-written or hand-completed receipts are more often used for infrequent or irregular transactions, or for transactions conducted in the absence of a terminal, cash register or point of sale: for example, as provided by a landlord to a tenant to record the receipt of rent. It can also be required when company representatives buy goods, because tax deduction rules might require hand signed receipts. Organizing receipts and similar financial documents is a multimillion-dollar industry in the United States. Consumers can use both desktop and online software to organize electronic receipts; sometimes, receipts are sent digitally from point of sale devices directly to consumers. The growing trend of digital receipts has led to the launch of new businesses focused on digital receipt management. Analytics predict a steady decline in the popularity of traditional paperwork in the near future, as entrepreneurs now seem to almost completely switch to online document-management software. 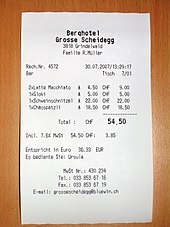 Wikimedia Commons has media related to Bills and receipts. Look up receipt in Wiktionary, the free dictionary. ^ "Packing list definition". Businessdictionary.com. Retrieved 2009-01-29. ^ Cavinato, Joseph L. (2000). Supply Chain and Transportation Dictionary, 4th Edition. Springer. p. 205. ISBN 0-7923-8444-X. ^ "ODLIS: Online Dictionary for Library and Information Science". Lu.com. 2007-11-19. Retrieved 2009-01-29. ^ a b "Legal Dictionary | Law.com". Dictionary.law.com. 2010-12-09. Retrieved 2013-09-03. ^ "Recordkeeping for Individuals". Irs.gov. Retrieved 2013-09-03. This page was last edited on 24 April 2019, at 19:59 (UTC).